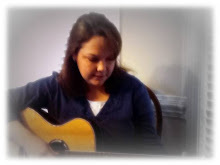 Here's a song I wrote to compliment a book that a teacher read to her class this week. The book is called "This is the Turkey" and it is written by Abby Levine. It is a beautifully illustrated book centering around the theme of the foods we eat at Thanksgiving and of course, family. In the story, a quite unusual accident happens with the Thanksgiving turkey...it slips out of the mother's hands and lands in an aquarium! Of course, the story then concentrates on the abundance of foods left for the feast and family surrounding us being the most important thing. In using this song after students have read the book, one could program a voice output device (such as a big mac) to say, "Oh Dear, Oh me, what will we eat?" or you could print out pictures of the foods in the song and allow students to choose "What will you eat?" via picture. Incorporating a GoTalk4 or GoTalk9 so that nonverbal students can choose which foods they will eat would also work well with this song. 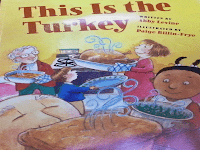 What are your favorite books for a Thanksgiving theme?